Lockheed unveiled an ambulance variant of its Joint Light Tactical Vehicle (JLTV) at the Modern Day Marine convention Oct. 5 in Quantico, Va. The back of the vehicle is configured to carry up to four injured soldiers and is wired to contain needed medical information, Lockheed officials said. “We’re getting a lot of positive feedback on the vehicle. This is the utility variant. 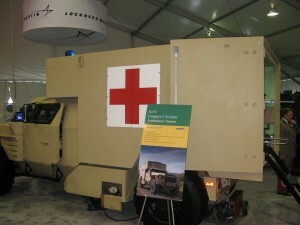 We took the shelter off and put the armored ambulance on,” said Lou Desantis, vice president of JLTV for Lockheed Martin.